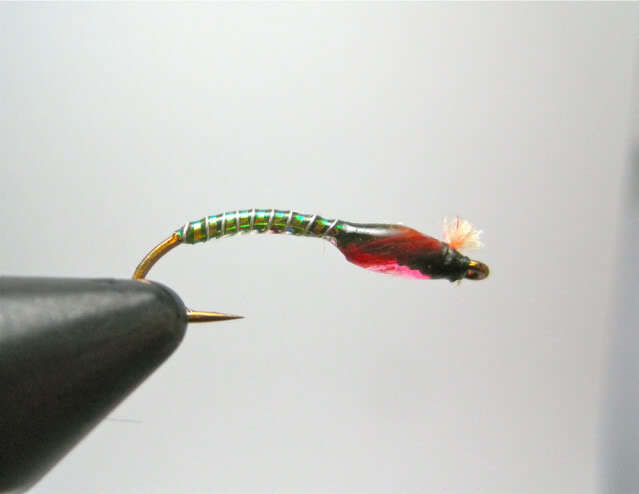 Part of the fun of fly fishing is tying flies to imitate what fish eat. I’ll be honest… I first got into fly tying to save money. Flies are not cheap and I was buying a lot of them. Now though, I tie because stores just don’t carry all of the patterns that really work and I also really enjoy it. I still buy flies occasionally but for the most part I tie my own. This is especially true for flies I use in lakes. We have all stood at the shallow edge of a lake during the warmer months of summer. Usually, unless its really cold, you can observe lots of small bugs buzzing about just over the surface. These bugs are midges. Midges live in almost all of the fresh water on earth. If there is standing fresh water, there are probably midges in it. 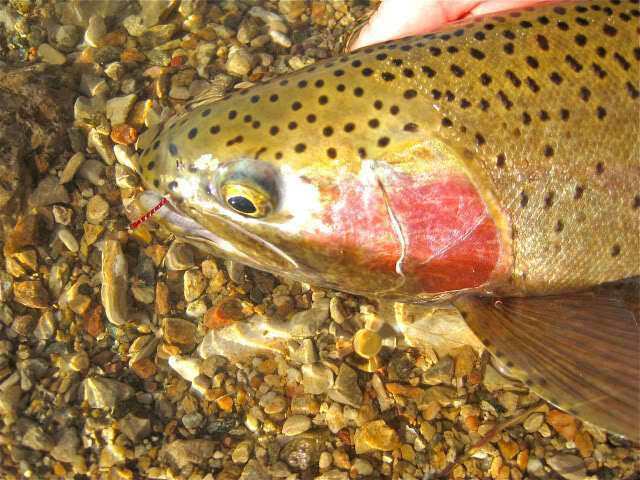 Trout eat them in all three stages of their life cycle, two of which occur under water. I’ve heard numbers starting at 50% all the way up to 80% referring to the the percentage that midges make up of a trouts diet in lakes. The percentage doesn’t matter, bottom line is that trout love them. The muddy bottoms of lakes contain the first stage of the midge life cycle… Larvae. 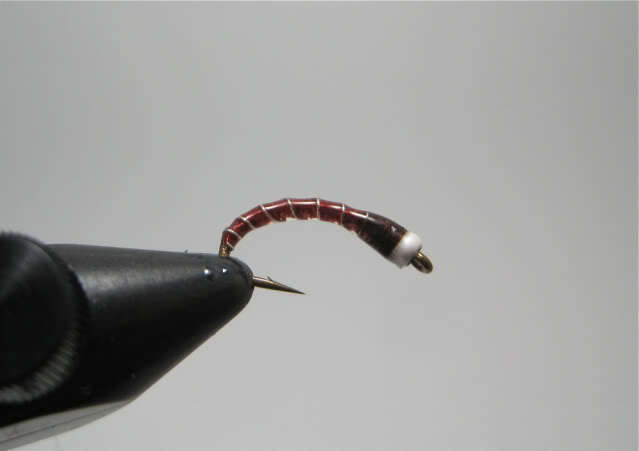 Midge larvae are often referred to as “bloodworms” for their red color. 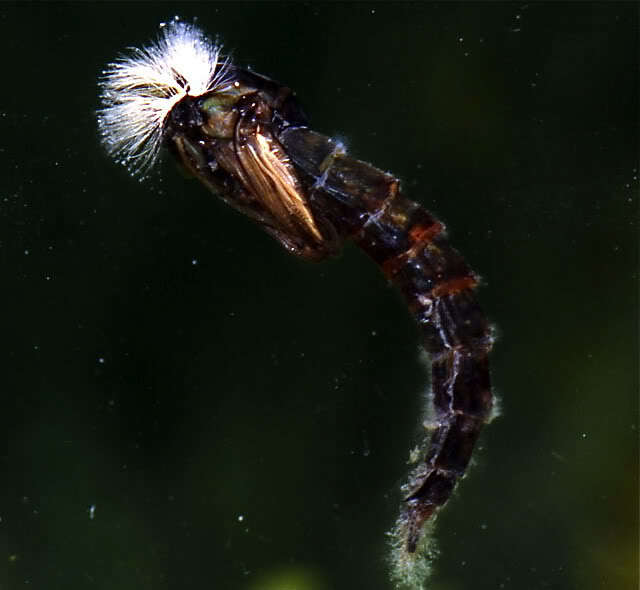 Here is a photo of an actual midge larva. 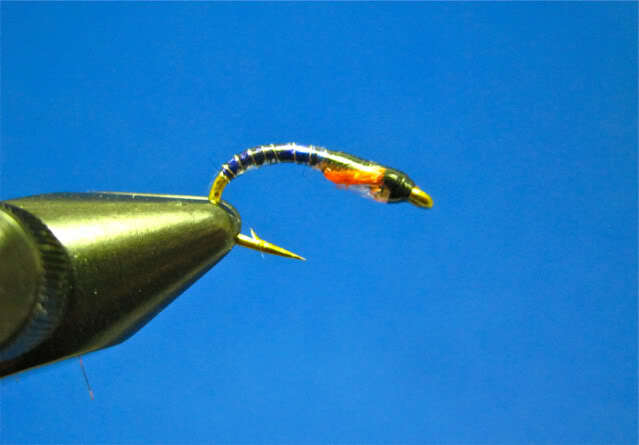 These are best imitated by long, slender flies with a shiny coating and some kind of segmentation. I tie mine in sizes 14-10. 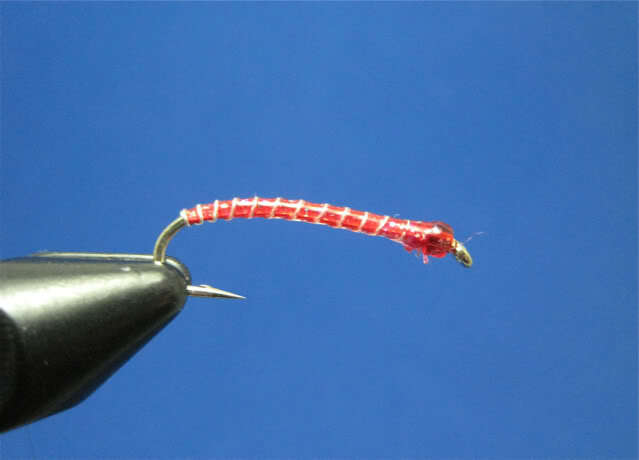 Midges spend most of their lives as blood worms and this is by far my most effective lake pattern. Bloodworms live at or near the bottom so I suspend these flies just off the bottom. Fish go nuts on them from ice out to late fall. This Montana Rainbow thought it looked like food on a trip I took last Spring. 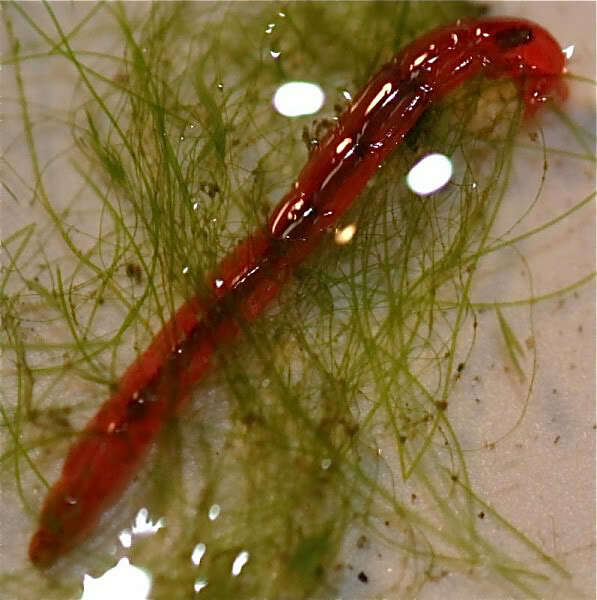 When the water warms in spring and the air temperature is warm enough for the adults to live, bloodworms transform into pupa. This is the second and shortest life cycle of a midge. The pupa grows small white gills near its head, is a dark or natural color, and traps a thin layer of gas around itself which aids in getting to the surface to hatch. They look like this. On sunny days the bright light illuminates the pupa as it wriggles to the surface and its best to fish a very shiny pupa pattern. These flies are referred to as “chromies”. For me, the “copper chromie” has been one of the most effective. I tie mine with a red rib. I like sizes 12 and 14 best and use Mustad C49S hooks. On cloudy days a more natural approach usually works better. My good friend Everet showed me these patterns. They work great in lower light conditions. 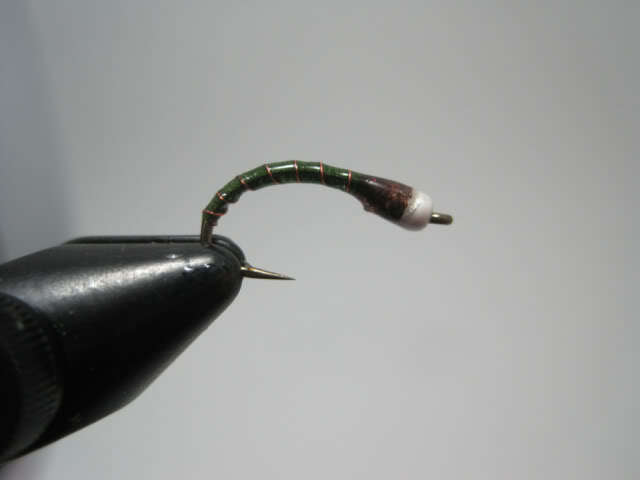 Another approach to imitating midge pupa comes from accross the pond. 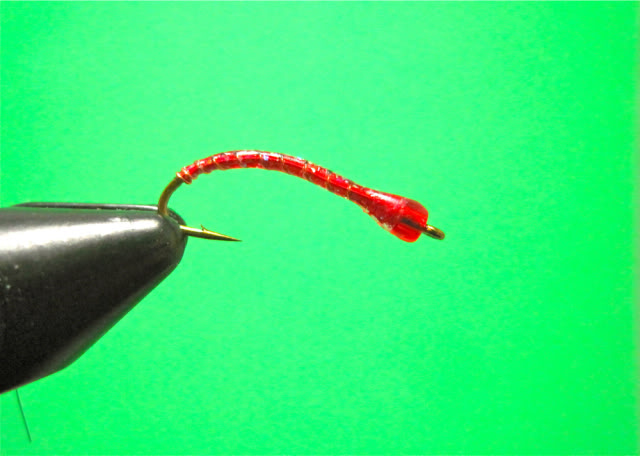 Europeans tie pupa with no bead at the hook eye. They call them “buzzers”. Some days these patterns work when nothing else will. 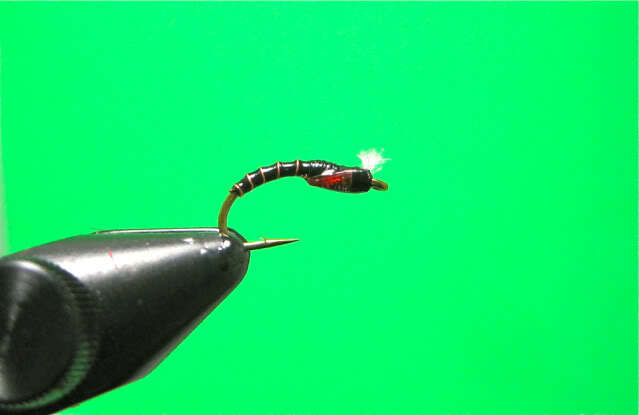 For me there is almost nothing better than watching a small floating indicator bouncing slightly in the water then suddenly tanking as a fish mistakes one of these flies for the real deal. A quick hook set is needed before the fish realizes it’s mistake. The sound of the fly line ripping up off the water on the hook set as it goes tight to a fish is sweet sweet music to a lake fisherman’s ears. 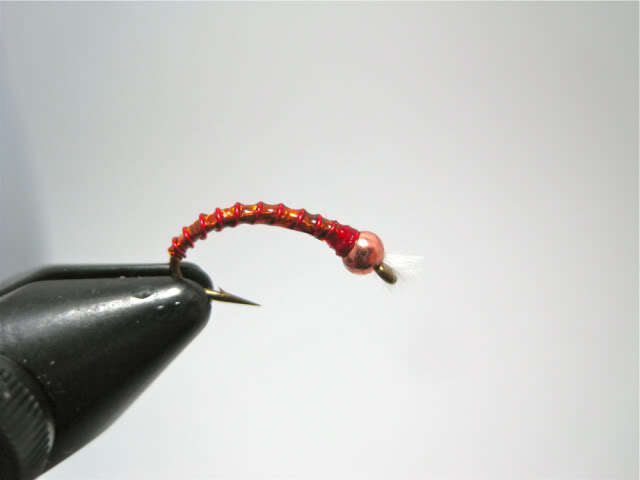 This entry was posted	on Sunday, January 15th, 2012 at 7:40 am	and is filed under Chironomids, Fish, Fly Fishing, Fly Tying, Lake Fishing, Midges, Stillwater, Trout. You can follow any responses to this entry through the RSS 2.0 feed. You can leave a response, or trackback from your own site. Great post! Seeing the link between nature and the vise gives equal parts education and enjoyment. I am seriously impressed. Those are amazingly detailed and I never thought about the expertise and background knowledge that goes into tying flies. Very cool!